Space Safety » Archive » News » Dragon is in Orbit! 13 minutes after launch, SpaceX's live coverage declared Dragon to be in orbit (Credits: SpaceX). SpaceX’s Falcon 9 successfully made its third launch into space, carrying the Dragon capsule. All systems performed norminally, with the Dragon capsule boosted into orbit and deploying its solar panels as expected. “Falcon flew perfectly!! Dragon in orbit, comm locked and solar arrays active!! Feels like a giant weight just came off my back :)” tweeted SpaceX founder, CEO, and chief designer Elon Musk after the launch. Spectators at SpaceX's California headquarters let out a big cheer as solar array deployment demonstrated that the Dragon capsule was performing nominally (Credits: SpaceX). The earlier abort was clearly on everyone’s minds today. The more than 1800 people watching from SpaceX’s Hawthorne, California facility held their cheer until the orbiting Dragon capsule’s solar arrays deployed, while NASA’s commentator, who had been caught off-guard by the May 19 abort with 0.5 seconds left on the clock, took a measureable pause before declaring “liftoff” this time around. The Dragon capsule is now scheduled for a busy testing schedule leading up to docking with the International Space Station on Friday, May 25. NASA astronaut Don Pettit will be in charge of grappling the capsule using the robotic Canadarm, assisted by ESA astronaut Andre Kuipers. 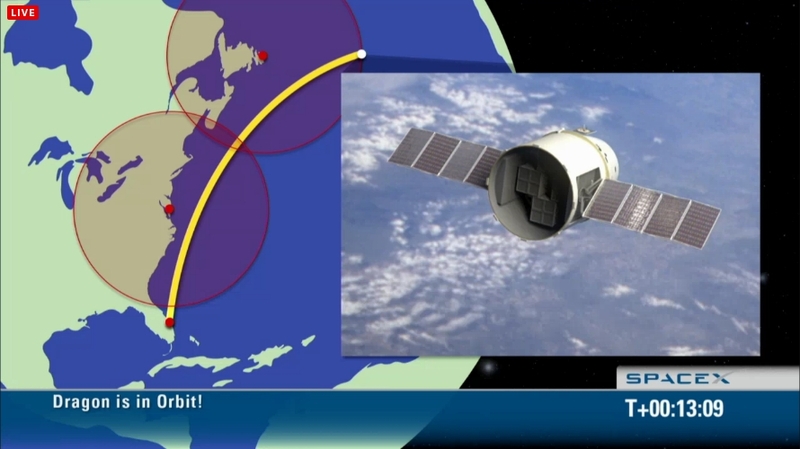 Dragon will then deliver its cargo of non-essential supplies. If successful, the Dragon will become the first commercial spacecraft to dock with ISS.